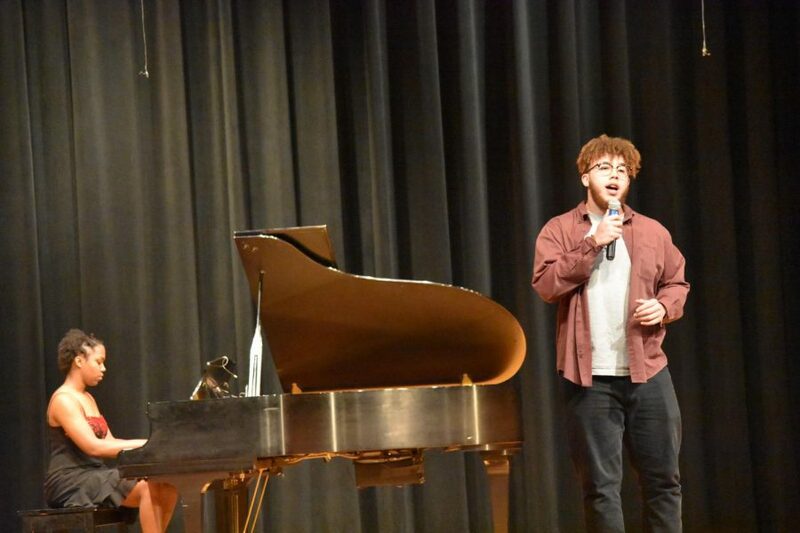 Riverbend High School’s talent show took place on Friday, February 23rd at 7 p.m. in the auditorium. Tryouts were held on January 23rd after school. This determined who was qualified for the school’s talent show, which would take place a month later. Michael Mullen, a.k.a. “Big Mike”, a junior at Riverbend, performed a rap that he wrote about society today, and how his thoughts on the world make him angry. Ever since he was twelve years old, he wanted to become more involved in the music industry. He said, “When I first started, I wasn’t necessarily considered a rapper, as my personality was different than a lot of others. I never told anyone about my passion and talent for writing, but when I heard about the talent show for this year, I felt I had taken enough pressure to put myself out there and show everyone what I can do; that there was more to me than what meets the eye. So I tried out, and at first, I thought I wasn’t going to make it, as I didn’t really know how the judges would feel. Turns out, they really loved it, and the rest is just history writing itself,” stated Mullen. Overall, the talent show was a great experience for anybody who went, especially for the performers who were willing to show their talents in front of all their peers. This was a job well done. Go Bears!